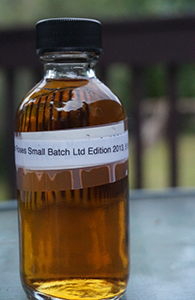 Almost exactly a year after my review of the 2016 Four Roses Small Batch, Ltd. Edition, here is my review of their 2017 release. a limited edition small batch release from last year to honour the 50 years of service of brand ambassador Al Young. This is not the annual release Small Batch Ltd. Edition, which came out later that year. In that series I’ve previously reviewed the 2010, 2012, 2013 and 2014 releases as well; if anyone wants to send me samples of the 2011, 2015 and 2016 releases so I can round out my reviews for the decade so far, please get in touch. Might as well make it all bourbon for this week’s whisky reviews. This is the 2016 release of Four Roses’ annual Small Batch Limited Edition release. In the last four years or so this series has gone from easily findable to not-very easily findable. I purchased a bottle of the 2012 release at a store in the Twin Cities, leaving many on the shelf behind it. Shortly thereafter it was swept up in trophy bourbon hysteria and I’ve not seen a bottle in the wild. I got this one in Europe, without too much fuss, at the original retail price. Here is the last installment of my Four Roses recipe roundup—try to contain your excitement. On the advice of more knowledgeable people, I’m ending the series with low and high-rye variations on the K yeast strain, which is said to be their spiciest. Let’s get right to it—I’ll have more comments on the entire exercise at the end. Here is the third entry in my Four Roses recipe roundup. Already posted this week: head-to-head reviews of OESQ and OBSQ barrels and of OESV and OBSV barrels. I really liked both barrels of the the Q, preferring the low-rye OE selection a little more. I was less excited about both V barrels, preferring the high-rye OB in that case. What will be the story with this pairing, which features the O yeast strain? Four Roses says it imparts rich fruit, light vanilla, caramel and full-bodied texture—that should put it right in my wheelhouse. Let’s see. Once again, these are both store selections. They’re also both 10 year olds, though the OBSO is at a whopping 60.6% abv to the OESO’s 52.6%! Here is the first of my head-to-head reviews of Four Roses’ various bourbon recipes. You can read far more detail about this than you care about in my post about this last week. Basically, I’m going to be comparing Four Roses low and high-rye recipes in pairs—each review will feature a comparison of the OE (low rye) and OB (high rye) mashbill with the same strain of yeast (there are five yeast strains and so there’ll be five posts with paired reviews). At least in theory, I should be able to get some sense of how the mashbill interacts with the yeast. All the reviews will feature pairs of single barrel releases selected by various stores. In this case the two barrels are of the same age (more or less; in addition to the age in years, Four Roses includes additional months but I’ve disregarded that). They’re also at fairly similar strengths. Doubtless there are other variables as well (warehouse location, for example) and it’s also unsound to take any single barrel as representative. With those caveats in mind let’s jump in. No, I’m not cooking with Four Roses. I’ve recently acquired single barrel samples of all 10 of Four Roses’ bourbon recipes and will be tasting and writing them up soon. This post is to invite your feedback on my proposed tasting plan. Let’s keep the bourbon reviews going a little longer, and let’s stick with the highly useful reviews of bourbons that are no longer available and were not widely available in the first place. This Four Roses single barrel was another bottling by the secret society 1789b—they who are the keepers of the True Cross and guardians of the location of the only known copy of the suppressed Hardy Boys mystery, The Secret of the Warren Commission. No, the “Paws & Claws” bit doesn’t refer to the exciting activities they get up to at group meetings on full moon nights: I’m told proceeds from this bottling (or some fraction thereof) benefited the animal rescue group, Paws & Claws. That’s a good thing. Sku likes to make fun of my habit of posting pictures of sample bottles alongside reviews and I suspect he takes particular pleasure in giving me unfeasibly crappily labeled sample bottles for just that reason when we do swaps. See evidence at left. But enough of Sku’s mistreatment of me and on to the whisky! I’ve had three of Four Roses’ ever-popular annual limited edition releases of their small batch series. I loved the 2012 (as everyone did) and thought the 2010 and 2013 were pretty damned good too (I’m not an exactly a rebel, flying in the face of received wisdom here). Word on the street has been less enthusiastic about the most recent iteration. Is this because it is really not as good? Or is it because fickle camp followers like Sku have moved on to new crushes such as Woodford Reserve? I will be the judge. You are welcome. The cult of the Four Roses Small Batch Limited Edition was a little slower to form than those of the annual Van Winkle and BTAC releases but it is now in full effect. I have previously reviewed the 2012 Limited Edition which, like yesterday’s Pappy 15, I purchased off the shelf in a Minneapolis store with no fuss at all (leaving many unclaimed behind it). Last year’s edition, however, I didn’t even see anywhere in the region and as I no longer chase hard to find bottles I don’t expect I’ll ever own another again. 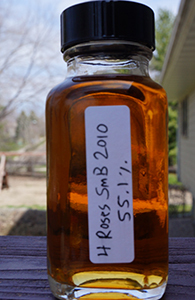 Luckily, I do know people willing to share and so here is a review of a Four Roses Small Batch Limited Edition from 2010, well before anybody was getting over-excited about this whisky. I wish all distilleries would list their vatting recipes on their labels. I know very little about bourbon and so will suggest that if you want to find out more about Four Roses you visit StraightBourbon.com or blogs such as the Sour Mash Manifesto, Scotch & Ice Cream, Sku’s Recent Eats or Chuck Cowdery’s blog. All I know really is that, along with Buffalo Trace, Four Roses present the most successful alternatives to the big name bourbons and Tennessee whiskies in the market; and that they make bourbons from a number of “recipes” (the variables are the mash bills and the type of yeast, I think)–this limited edition small batch is a vatting of four of those recipes as indicated above.